As you return to base camp, a hearty meal awaits you prepared by skilled cooks in a covered dining tent. 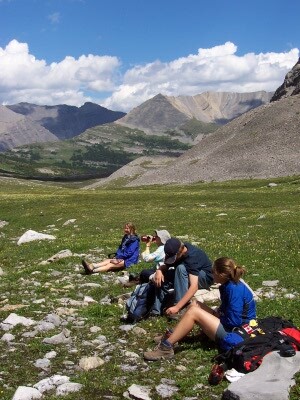 Sit around with fellow hikers reminiscing about the day's adventures. Following dinner, gather around a campfire for an evening of singing, story telling or just good companionship. It has been described as "backpacking without the backpack." We offer weekly hikes during July and August, departing on a Monday and returning the following Saturday. You do the hiking; we manage the camp, carry your gear, and provide all meals. Accommodation is provided for up to 54 hikers in each camp. Each tent holds from two to four hikers, and has a knee-high raised cot with foam sleeping pads. In addition to the professional cooks and camp staff, each hike has a volunteer host or hostess, chief leader, camp musician, and medical personnel. On the first and last days, there is a hike into the base camp while the outfitter transports your gear by pack horse. 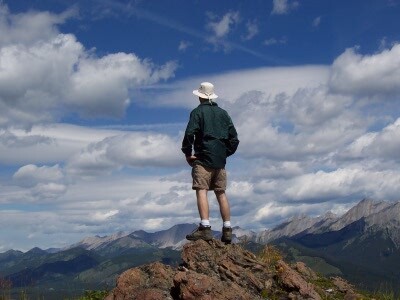 Each hiker participates in daily hikes suited to his or her particular abilities. Day hikes may range from easy jaunts to a nearby waterfall, to a strenuous climb to a mountain lookout. Distances range from 5 to 25 kilometers with up to 1500 meter elevation gain. Remember that this is a mountain camp, not a resort hotel. We can't provide flush toilets or showers, but we can promise everything you need for a great wilderness experience. The camp staff ensures that hot wash water is available morning and afternoon, serves two great hot meals a day in camp and packs a lunch that will keep you going on the trail. You and your fellow hikers will have time to get together to swap stories at the end of the day and everyone will enjoy an evening get-together to review the days’ events, plan tomorrow's hike, learn more about ecology and history of the area, and sing a few songs and tell stories around the campfire.